I broke 3 bones in my foot 2 weeks ago, the doctor put me in a walking boot. The swelling as gone down & iv got little pain apart from my toes they are still swollen and really hurt, i can move them a little bit.. Is this normal? Well... you have three fractures, although with the limited view I have from the enclosed x-ray, I can see the fractures at the neck of the third and fourth metatarsal bones, and am assuming the second metatarsal may also be broken, although I am limited by looking at one view which happens to be a very small view. In any event your question is whether or not your pain is normal. I would think that you would still be feeling "some" pain and I would also assume the doctor would have given you pain medication. In general terms, if the pain is diminishing on a regular basis then you are probably doing alright. Every one has a different pain threshold and so it is difficult for me to judge what "really hurts" actually means. will ending up causing pain. I do not know how old you are, nor do I know of any medical conditions that you may have, or the possibility of whether or not you are a smoker. In other words, outside factors could also impact the ability of the fracture to heal. I would have taken a more conservative approach. Not only would I have put you in a cast, but I would have put you non-weightbearing using crutches. 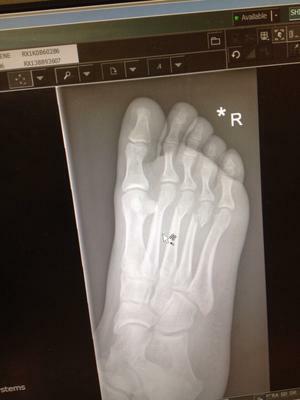 If the fracture line on the fourth metatarsal is as fragile as it appears, I would not want you bearing weight on the foot as this could further dislodge the metatarsal head and at the very least delay healing. Here is the U.S. with fractures of the this nature we also prescribe bone stimulators which are devices that facilitate the healing of fractures. In this day and age we start them on fresh fractures, whereas years ago, we had to wait months before an insurance company would cover them. Not sure what the rules are in the U.K. but I would recommend you inquire about their availability. I would suggest you have a follow up x-ray in two weeks (four weeks from date of trauma) to access how the fractures are progressing. If the alignment looks better on a different view and the fracture sites are showing the cardinal signs of healing, mainly bone callus formation surrounding the fracture, then you have nothing to worry about. If I happen to be correct about my opinion based on one view (and I could easily be wrong), and there is not proper signs of healing, then you may an issue. My advice, therefore, would be to ask your doctor if he or she is satisfied with the alignment of the fourth metatarsal head and whether or not the bone is showing signs of healing. If the answer is yes to both questions, then you will probably do fine. If not, you may have to consider more aggressive treatment.